The laptop experience is kind of built-around - and largely defined by - the inevitable tension between portability and performance. Some prefer notebooks that march to the steady drumbeat of Moore’s law. Others measure their proximity to the cutting edge by how much they can physically save on form-factor by shaving off the corners with each iteration. Few brands can truly escape the gravity of this equation where one side seems destined to inevitably step on the other’s toes. Keeping those dynamics in mind, the new, refreshed HP Envy x360 feels like a device that entrenches itself firmly with the latter side of things. It’s a device that ticks most of the correct boxes but keeps the focus firmly on the results. If that’s exactly what you’re looking for and want out of a portable PC, this approach is likely to run true. However, if you’re a sucker for portability, this probably won’t suit all comers. 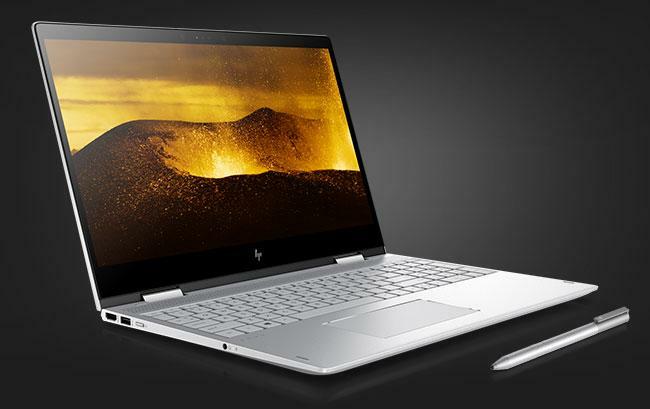 The original HP Envy x360 ran on seventh and eighth-gen Intel CPUs paired with Nvidia-powered graphics. The refreshed model we got to play with ran on AMD’s new Ryzen 5 2500U CPU with integrated VEGA 8 graphics. Like the original Envy x360, this Ryzen mobile-rigged effort boasts a 15-inch FHD UWVA micro-edge WLED-backlit display and 16GB of memory. Storage-wise, the Envy x360 carries a clean combo of a 1TB HDD and a 256GB SSD. 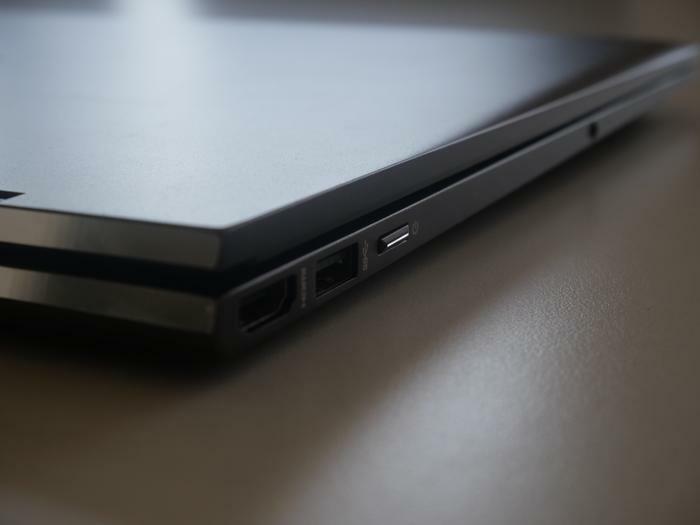 Then, when it comes to ports, it runs a matching set of USB 3.0 slots, a USB-Type C slot, a headphone jack, a HDMI out and an SD slot. All the usual suspects, really. The convertible also boasts a full 360-degree hinge, allowing it to be flipped around and used either as a traditional laptop, tablet or even set to ‘tent’ mode for entertainment experiences. Speaking of said entertainment expenses, the last design detail note here is the Bang & Olufsen speaker grill that runs just above the keyboard. At a glance, the guiding principle behind the Envy x360 is a pretty intriguing one. It’s a convertible with all the stylish flourish and flair you’d expect of the modern HP playbook but, beneath that, it’s a device that clearly puts privileges the performance side of things above real-world portability. Even if every corner of the Envy feels like it's positively dripping with premium flourish, like the honeycombed speaker grill - it all feels a little superfluous like icing on a cake. As mentioned before, there are plenty of brands out there playing the “thinner is better” game. HP have even dabbled in it themselves. However, with the Envy x360, HP have opted to enforce only the loosest principles of that approach. It isn’t thin - but it certainly feels thinner than it could have been. If I had to make a comparison to anything, Microsoft’s Surface Book seems like the most place to start. Unfortunately, this approach feels like one where looking good has been put ahead of actually feeling good in any tangible, ergonomic sense. The hinge here is as reliable to use as it probably needs to be. Unfortunately, it often feels like it doesn’t do a particularly great job of holding the display in place. Even a small bump or adjustment will see it careen and wobble back and forth. 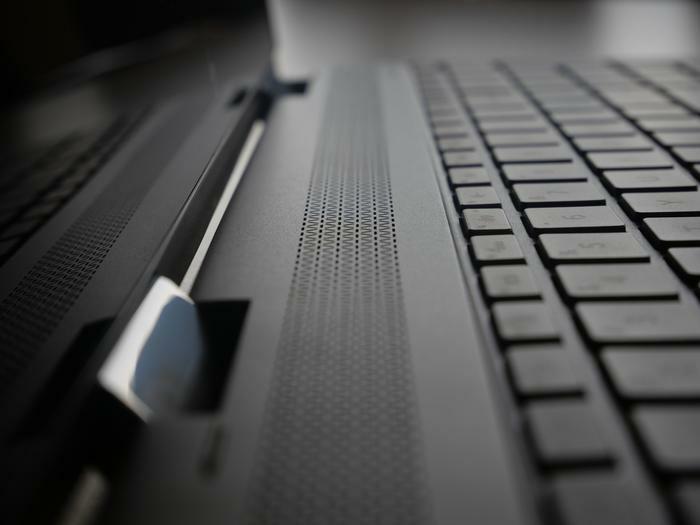 Courtesy of the ultra-flexible hinge binding together to Envy x360’s touch sensitive display and more-solid keyboard base, you could totally use this thing as a tablet. However, again much like the Surface Book 2, the heft involved all but assures you probably won’t want to. It feels like an option included more by courtesy or convention than actual, tangible, utility. At times, the design of the HP Envy x360 leaves it feeling less like a portable powerbook and more like an all-in-one PC with its own dedicated power supply and a built-in monitor. As always, the conflict between ergonomics and aesthetics on display serves to breed interesting results when it comes to performance. 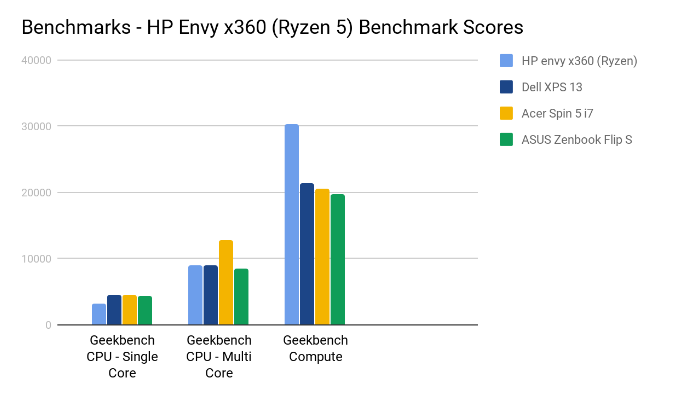 As you can see on the chart below, the Ryzen 5 rigged up inside the Envy x360 doesn’t make a huge difference over Intel when it comes to Geekbench’s CPU tests. However, when it comes to compute, it’s a whole different story. What’s more, that story is built on in a pretty meaningful way by the performance of the HP Envy x360 in more graphics-focused benchmarks. Mind you, the emphasis is more on playable frames-per-second here than it is visual fidelity. When it came to everyday gaming, the Envy x360 wasn’t up to running modern games like Middle Earth: Shadow of War or Wolfenstein: The New Colossus at anything above low. Things definitely didn’t look pretty, but they did run at a more-or-less playable framerate. 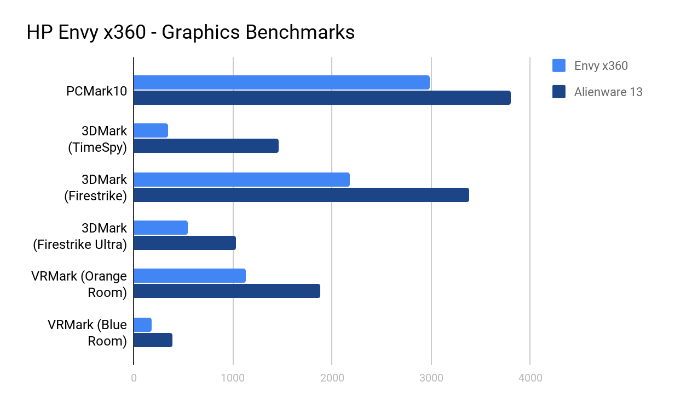 The results, shown below, reflect that - while the on-board graphics attached Ryzen Mobile isn’t necessarily going to compete with a dedicated graphics offering, it gets a lot closer than you might expect. And again, if you’re willing to crank those graphics options down, it does a pretty good job of delivering on a stable frame-rate. 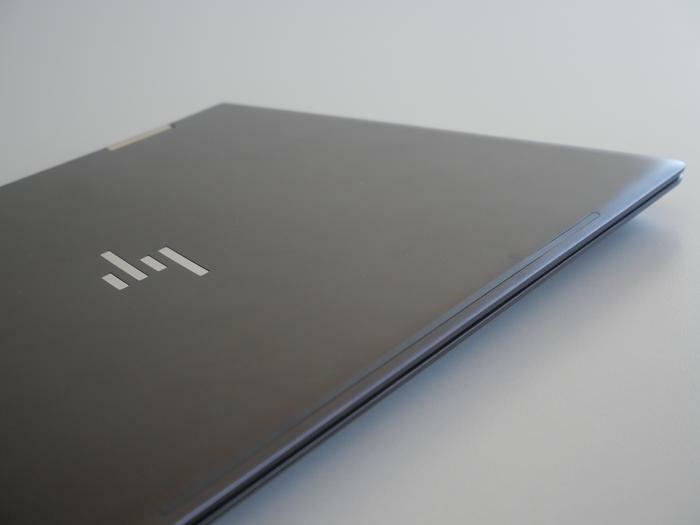 When subjected to the Battery Eater testing tool, which gauges the absolute minimum battery life of a given notebook PC, the HP Envy x360 took just 1 hour and 23 minutes to dissipate its entire charge.